On Smithsonian Museum Day, Saturday, Sept. 22, the Academy is honoring women making science history. General admission to the museum will be free, and visitors will be able to talk with some of our female scientists making a difference. We profile some of them here so you can get to know them before you come. Have your questions ready! 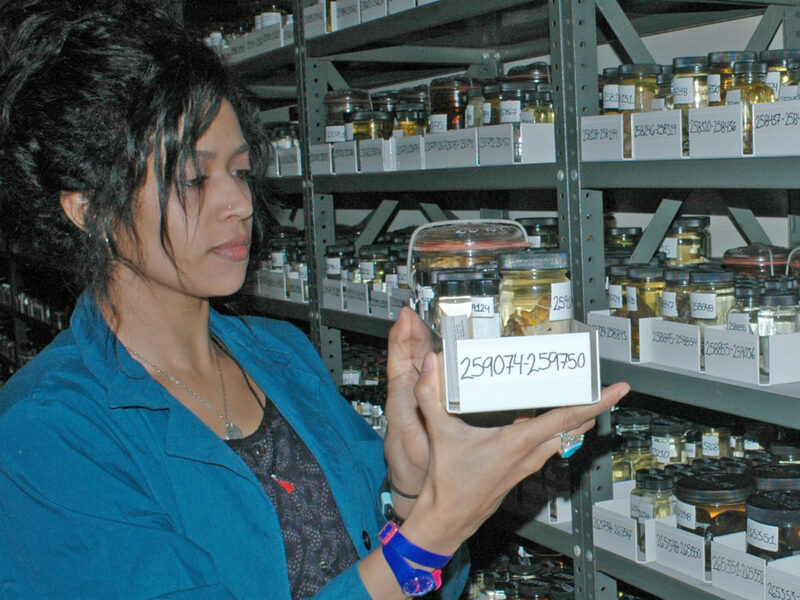 Nasreen Phillips is the collection manager for Malacology. Nasreen Phillips had always worked in museums but found her passion for natural history collections during graduate school while working at the Oxford University Museum of Natural History in England. She worked in the fluid collections (i.e. dead things in jars with some form of liquid preservative). The British referred to them as “spirit collections,” an intriguing name that marked the start of a career full of intriguing items. When an opportunity at the Academy presented itself, Phillips couldn’t jump fast enough at the chance to work with our world-renowned mollusk collection. She loves that she gets to solve what she calls “mollusk mysteries,” such as finding a lost shell and reuniting it with the collection, or reading notes written during long-ago research expeditions. Stefanie Kroll is the section leader for Watershed Ecology and an assistant research professor. Stefanie Kroll, PhD, went fishing with her father as a child and a love for water has carried her through her career. After her first experiences taking stream samples, she knew she was hooked. 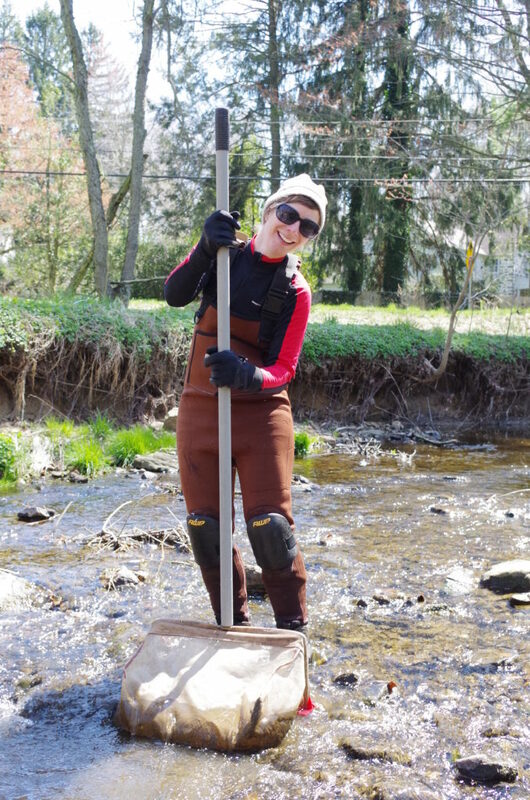 She’s studied salmon reintroduction in New York, aquatic insects in Spain, and is now the lead scientist for the Delaware River Watershed Initiative, where she assesses rivers and streams and how they respond to human activities. Even after years of studying aquatic ecosystems, Kroll has not lost her sense of wonder. She continues to be amazed at the unique adaptations that make aquatic insects so special – hairs that repel water but attract oxygen, the ability to use silk and stone to weave cases for their bodies, complex mating behaviors. “Just looking at these tiny creatures with relatively simple eyes and brains puts me at awe of what evolution can produce, and how they can survive in the tough conditions in a river,” Kroll said. Rosie Oakes is a postdoctoral researcher in Invertebrate Paleontology. Rosie Oakes, PhD, has a motto for explaining the impacts of her research: “It’s important to understand what’s happening to the little things so that you can understand what might happen to the big things.” Ocean ecosystems are changing; Oakes examines how ocean acidification (resulting from increased levels of carbon dioxide in the atmosphere) affects shell thickness of small swimming snails called pteropods. She compares the shells of present-day pteropods to those over the last 150 years from museum collections like those at the Academy. Her studies have taken her around the world: from home in England to college at Edinburgh University in Scotland, to University of Toronto, Canada for her master’s, to Penn State University for her doctorate to Philadelphia. 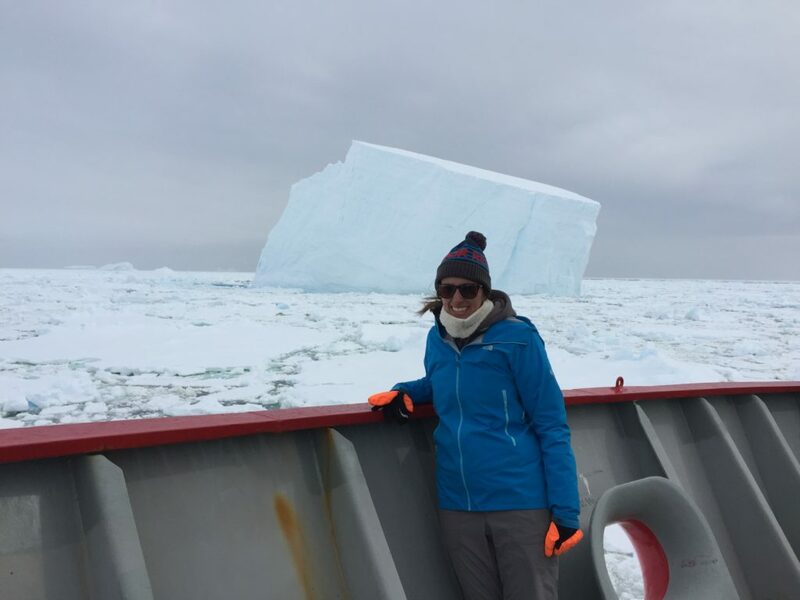 Her favorite experience along the way was collecting plankton in the Southern Ocean as part of the British Antarctic Survey Cruise. In one of the most remote places on earth, she could fully appreciate the vastness of the ocean. She hopes to someday do research in the Arctic, where the ecosystem is changing more rapidly than in other regions, to explore how those changes affect the lowest levels of the food chain. Which women scientists have inspired you? “Ahuva Almogi-Labin (Hebrew University of Jerusalem) and Carol Lalli (University of Washington) were both active in pteropod research in 1980s. Their work addressed fundamental questions about pteropod biology and the fossil record. They were well-respected, and I am grateful that they paved the way for other women. My earliest exposure to science came from my mum, a high school biology teacher who is constantly curious about the world around her. Amanda Chan is a staff scientist and field team leader in the Patrick Center for Environmental Research. Chan credits her parents for accepting her “curious” childhood interests, allowing her to develop those interests into a career. 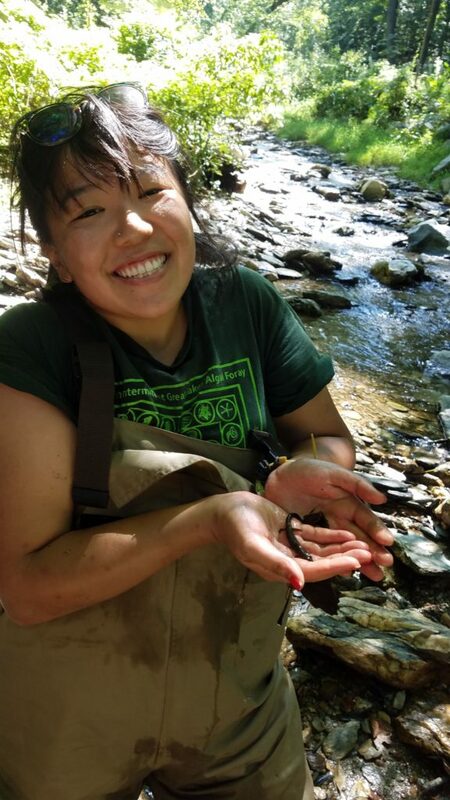 At the Academy, Chan is often in the field, studying the plants and critters that live in and near streams to help determine how clean the water is. “I get excited whenever I put on a pair of chest waders. That’s how I know we’re going to get really wet and probably really dirty,” Chan said of the gear she needs to don. Just as captivated by critters now as during her childhood, she easily geeks-out over a chunky salamander or a cute little brook trout. 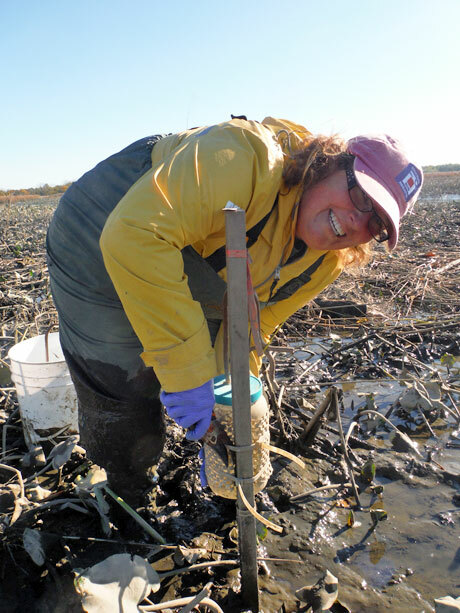 Elizabeth Watson is wetlands section leader in the Patrick Center for Environmental Research and an assistant professor of wetlands science. Elizabeth Watson, PhD, joined the Academy after working as a research ecologist at the Environmental Protection Agency. She researches wetland and estuarine ecology, historical ecology, remote sensing, and ecohydrology. Being a professor in Drexel’s Department of Biodiversity, Earth, and Environmental Science is a natural fit, given her love of science, learning and helping students relate to their world. Post by Kathryn Christopher, manager of science communications and outreach.